The silver drummer Kyphosus sydneyanus is found in the south Pacific and feeds exclusively on macroalgae. The southern hemisphere has a number of marine fish that exclusively eat macroalgae (seaweeds). Red, green and brown algae are rather different to each other (and land plants) in terms of their nutritional value, and many of the algal components are indigestible to vertebrates. What are these herbivorous fish really eating (are they targeting specific algal species? ), and how do they gain energy and nutrition from such a diet? Do these fish rely on gut microbes to digest their algae diet, similar to ruminating animals on land? During my MSc I worked with Kendall Clements and Sue Turner at the University of Auckland to answer some of these questions. Even juvenile silver drummer are almost entirely herbivorous, which is very uncommon for marine fish. The first part of the project was characterising the stomach contents of silver drummer (adult and juvenile pictured above) of different sizes throughout the year in the Hauraki Gulf, northern New Zealand. Silver drummer appear to be fairly strict herbivores from an early age. This is rather unique for marine fish. The juveniles eat mostly red and green macroalgae, but gradually consume more brown macroalgae as they grow. Most of the red macroalgal species the larger fish consumed are epiphytes of brown macroalgae. The result of many days work staring down the microscope at small pieces of macroalgae from stomachs of silver drummer. Red and green algae tend to have more digestible carbohydrates compared to brown algae. It appears that the juvenile silver drummer eat a diet higher in starch-like carbohydrates compared to the adults. Not surprisingly, the activity of starch degrading enzymes in the intestine of juveniles was found to be higher than larger fish. So, how are the adults digesting their diet? Other researchers have suggested that some fish are able to digest their food using symbiotic gut microbes, much like terrestrial animals do. Do silver drummer use microbes to digest their apparently indigestible diet? Well, silver drummer certainly do have long digestive tracts! This is also characteristic of land animals that use microbes to digest plant material. Like terrestrial herbivores that digest via microbial fermentation, adult silver drummer have very long guts. If silver drummer use microbes for digestion, one might expect to find short-chain fatty acids (SCFA) in the intestine. These end-products of microbial fermentation can be absorbed by vertebrates, and are an important nutritional source for many terrestrial herbivores. There were indeed significant concentrations of SCFA present in the intestine of silver drummer, and the concentrations increased in adults. I worked with Sue Turner at the University of Auckland to characterise the microbes in the gut of silver drummer using molecular genetic techniques. I sampled intestinal contents of fish of different sizes, and used T-RFLP to assess microbial diversity, and DNA sequencing to identify the predominant microbial groups. The T-RFLP results showed that the diversity of bacterial groups (operational taxonomic units, OTU's) increases with fish size, and to a lesser degree, increases down the length of the gut. Changes in bacterial diversity in different sections of the gut and at different ages. DNA sequencing was used to identify the dominant bacterial groups present in the T-RFLP analysis. Most of the bacteria were found to be related to members of the genus Clostridium. Several species of Clostridium are known to help terrestrial herbivores digest their food via the process of fermentation. Clostridia bacteria are common in the guts of many animals. The blue blocks represent bacteria from the gut of silver drummer. Interestingly, a study by Isabel Pasch showed that these bacteria were also present in the guts of other herbivorous marine fish species found in New Zealand. 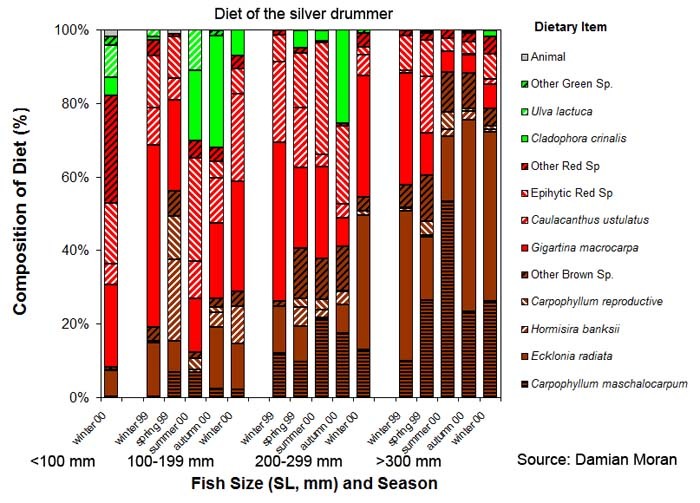 Butterfish (greenbone, Odax pullus) have a similar diet to silver drummer (brown and red macroalgae), while marblefish (Aplocatylus arctidens) eat mostly red and green macroalgae. Comparison of bacteria isolated from the guts of three different herbivorous fish species. (1) as the silver drummer grows it changes from a diet containing digestible starch-like nutrients (red and green macroalgae), to a diet high in nutrients that are indigestible to the fish (brown macroalgae). These findings suggest that juvenile silver drummer rely on their own digestive capacity to digest their diet, but as they grow they gradually switch diet and rely on bacteria to ferment the nutrients into SCFA, which the fish can then absorb. Moran, D; Clements, K.D. (2002). Diet and endogenous carbohydrases in the temperate marine herbivorous fish Kyphosus sydneyanus. Journal of Fish Biology 60:1190-1203. Moran, D; Turner, S; Clements, K.D. (2005). Ontogenetic development of the gastrointestinal microbiota in the marine herbivorous fish Kyphosus sydneyanus. Microbial Ecology 49:590-597. Clements, K.D. ; Pasch, I.B.Y. ; Moran, D.; Turner, S. (2005). Clostridia dominate 16S rRNA gene libraries prepared from the hindgut of temperate marine herbivorous fish. Marine Biology 150:1431-1440. This research was funded by a Marsden Fund grant awarded to Kendall Clements.